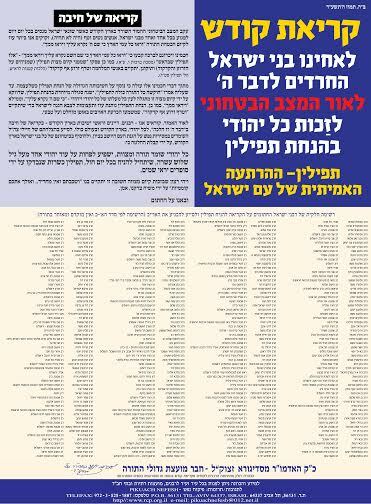 In light of the current situation in Israel hundreds of rabbis in Israel, members of the Rabbinical Congress for Peace (RCP), have issued a call to Jews around the world to intensify the Tefilin Campaign citing the Talmudic dictum that Tefilin instills fear in the hearts of Israel’s enemies. Our Sages in the Talmud quote the Divine promise that in the merit of the mitzvah of tefilin, “all the nations of the world will see that the name of G-d is called upon you, and they will fear you” (Deuteronomy 28:10). When a Jew in Colorado, Brazil, England, France or anywhere else on the globe puts on Tefilin he adds to the security of Israel,” said Rabbi Avrohom Shmuel Lewin, Director of the Rabbinical Congress for Peace. The RCP therefore called on Jewish leaders and rabbis around the world that during their Sabbath sermons they should urge their congregations to see that at least one more Jew starts donning Tefilin and those who already wear Tefilin during the weekdays should check if they’re kosher. “If every observant Jew will commit himself to persuade one more Jew to put on Tefilin this will bring about a devastating defeat of Hamas and all of Israel’s enemies who are seeking its destruction and will lead to a true and durable peace in the region,” said Rabbi Lewin. Needless to say. The RCP rabbis are always backing and supporting the IDF. This is obviously in addition. 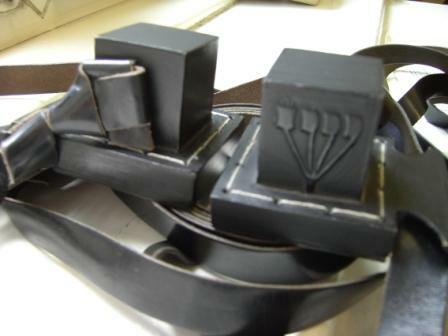 Go out there and put tefillin on another yid!